A remote-control helicopter attacks P.I. Billie Bly during her early morning run. As she investigates, a mysterious Chinese woman tries to kill her, murders an investment banker with an exploding drone, and frames her new boyfriend.Federal agencies swoop into Portland, determined to find and arrest a terrorist cell but settle for Billie's new boyfriend, who manufactures remote-aircraft and drones. The blonde P.I. is thwarted at every turn by the assassin, who has plans to kill a presidential candidate in downtown Pioneer Square. Who will track her down first? 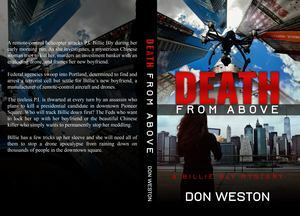 The Feds who want to lock her up with her boyfriend or the beautiful Chinese killer who simply wants to permanently stop her meddling.Billie has a few tricks up her sleeve and she will need all of them to stop a drone apocalypse from raining down on thousands of people in the downtown square.